The playoffs will be here very shortly, in fact the Tomahawks only have eight more games until playoff time. With playoffs so near the exact position where teams will finish are still anyone's guess. The Soo Eagles, Kalamazoo Jr. K-Wings, and Jamestown Ironmen all have clinched a playoff spot. There's still three spots remaining in the North division with five teams battling to win a spot. The North division is the only division in the league where six teams make the playoffs, every other division sends the top four. The first round of the playoffs are schedule to be a Best-Of-Five series, except in the North. The team in third place will play the team that finishes in sixth place in a Best-Of-Three play in series. The team in fourth will play the fifth place team in a Best-of-Three play-in series. Clubs separated by a distance of over 300 miles- If the Clubs facing each other in a play in series are separated by a distance greater than 300 miles, then the top seeded Club shall host games 1 and 2, and the lower seeded club shall host game 3 (if necessary). Clubs separated by a distance of 300 miles or less-If the Clubs facing each other in a play in series are separated by a distance of 300 miles or less, then the top seeded Club shall host game 1, the lower seeded Club shall host game 2, and the top seeded club shall host game 3 (if necessary). The NAHL Executive Committee shall determine the schedule of play in series competition in any series of games where there is no mutual agreement between the competing Clubs. After the two play in rounds are concluded, the top four teams will play a Best-of-Five series, 1 vs 4 and 2 vs 3. The winners of those series will then face off against each other to determine a Division champion. Each division's "champ" will then move onto the Robertson Cup Tournament in Frisco, TX. The Tomahawks currently sit in fourth place, 56 points. 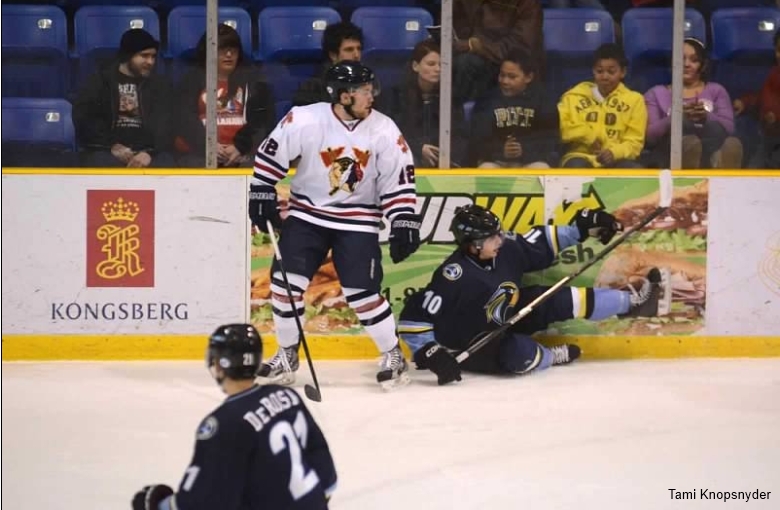 If the Tomahawks would win their last eight games and Soo, Kalamazoo, Jamestown lose their remaining games, Johnstown would finish with 72 points, a tie with Soo for first place, but that is not going to happen. Johnstown would have home ice advantage, and being separated by 408 miles, Johnstown would play the first two games at home (then the third in Port Huron if needed). This season vs Port Huron, Johnstown is 2-6-0. Port Huron isn't the best team in the league but for whatever reason Johnstown has a tough time with them. Funny that the one team Johnstown can't seem to find an answer for, is the one team we might play first in the playoffs. As the last remaining games come to a close we'll get a better picture on what the match ups will be, but as of this article (2/25/13) it appears Johnstown might have to battle Port Huron.